Aurora Cannabis (TSX:ACB)(NYSE:ACB) stock is among the hottest stocks on the TSX right now, especially after it has climbed 88% from a low just a few months ago in December! If you’re thinking of buying the growth stock, here are some important things you should know. Aurora Cannabis is growing at a tremendous rate. It reported $1.4 million of revenue in 2016. Revenue has exploded 85 times to $119 million in about 3.5 years! In the last reported quarter, fiscal Q2 2019, Aurora Cannabis saw net revenue growth of 83% compared to the previous quarter. This kind of crazy top-line growth is extraordinary in the midst of chatters about a global economic slowdown. The company is aggressively growing by making strategic acquisitions and expanding internationally. For example, last month, Aurora Cannabis expanded its footprint in Europe by entering Portugal. It bought a 51% ownership interest in a licence applicant, which allowed Aurora Cannabis to establish a local facility to produce medical cannabis and derivative products. Aurora Cannabis now has operations in 24 countries across five continents. Further, early this month, Aurora Cannabis strengthened its position in Canada by completing the acquisition of Whistler Medical Marijuana Corporation. Aggressive growth naturally comes with increasing costs. While Aurora Cannabis increased revenue at a high pace, so has its costs. Specifically, the company’s selling, general, and administrative expense — a key metric showing cost not related to production — was more than 39 times what it was in 2016. As a result of high operating expenses, Aurora Cannabis is unable to post consistent profits. The company was profitable in two of the last four reported quarters, which resulted in a trailing 12-month net loss of $71.6 million. Aurora Cannabis has a strong balance sheet. It last reported long-term debt of $339 million and a debt-to-asset ratio of less than 12%. However, the strong balance sheet came with the cost of diluting current shareholders. The following graph shows that Aurora Cannabis has diluted shareholders more than its peers in the last three years. 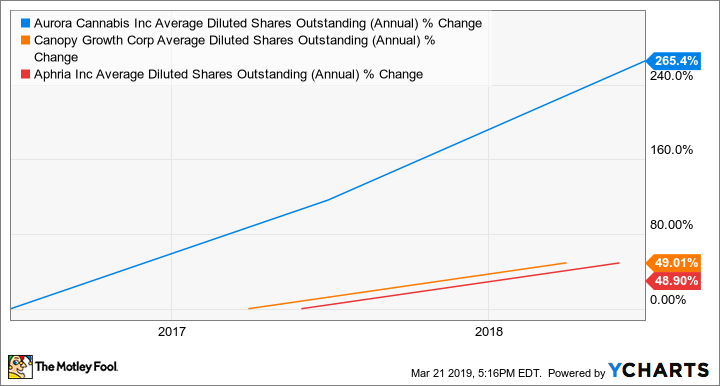 ACB Average Diluted Shares Outstanding (Annual) data by YCharts. The marijuana industry is highly competitive. So, none of the marijuana stocks mentioned are posting consistent profits yet. It’s very easy for investors to get hurt in their strikingly volatile stock price actions — especially so after ACB stock has run up. If anything, speculative investors can look for a lower-risk entry point below $7 per share. If you already own the stock, consider exiting, perhaps, at about $12-14 per share.